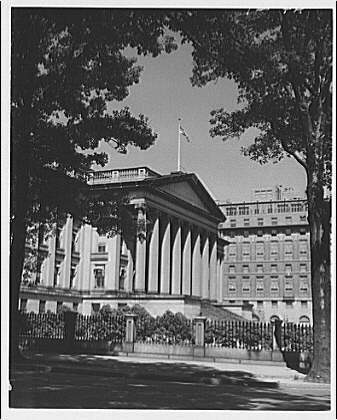 The Treasury building is the home of the federal government’s second department, established in 1789. The building was erected between 1836 and 1869, and is the work of five major American architects—Robert Mills, Thomas U. Walter, Ammi B. Young, Isaiah Rogers, and Alfred B. Mullett. 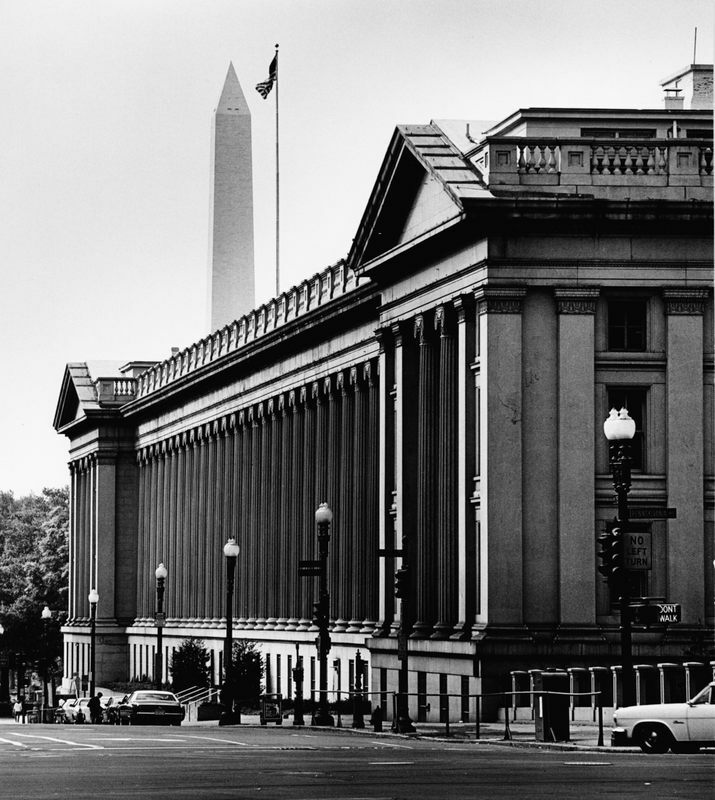 Conceived and built in the Greek Revival style which so captured the spirit of the young republic, this building and the Patent Office, undertaken at the same time, are the most outstanding examples of Greek Revival civil architecture in the country. 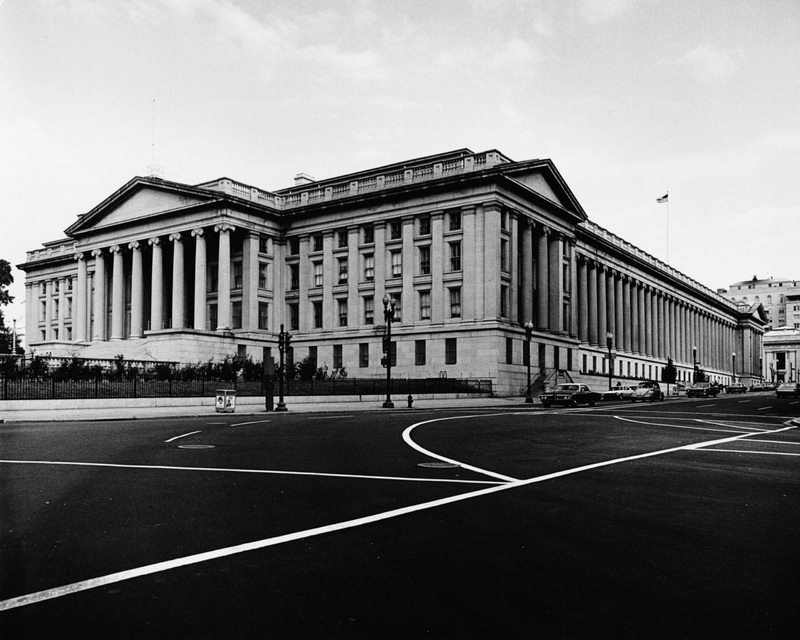 Not only were they the largest non-military buildings undertaken by the federal government in their own time, but they also influenced countless examples of civil architecture across the nation. From 1800, the Treasury Department was housed in the first of George Hadfield’s three brick Executive Offices, built in 1798-99 on the site of the present north wing. 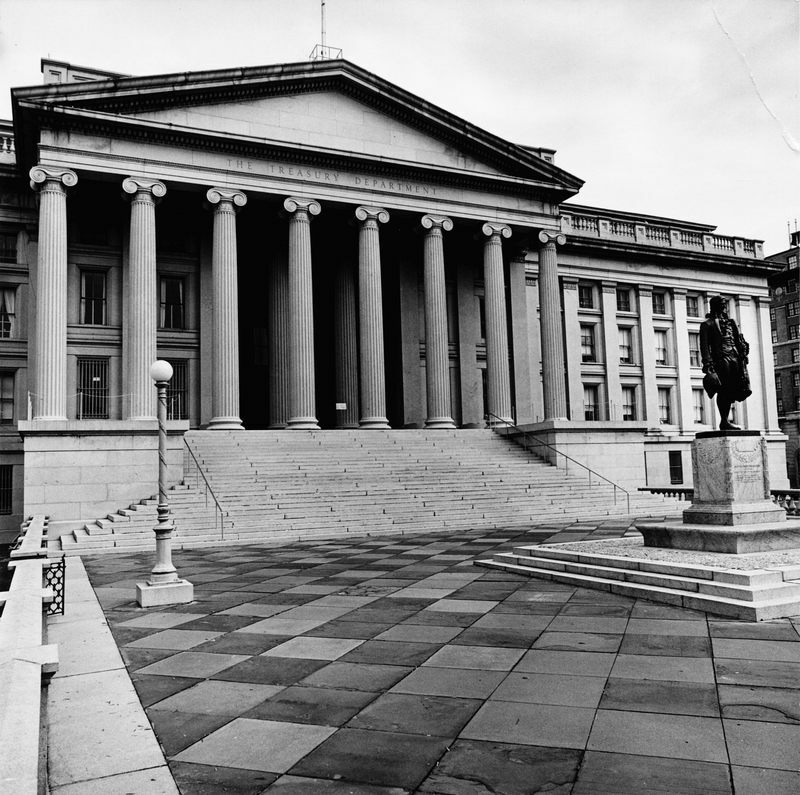 The Treasury Office caught fire in 1801, 1814, and 1833, and was not reconstructed after the third conflagration. 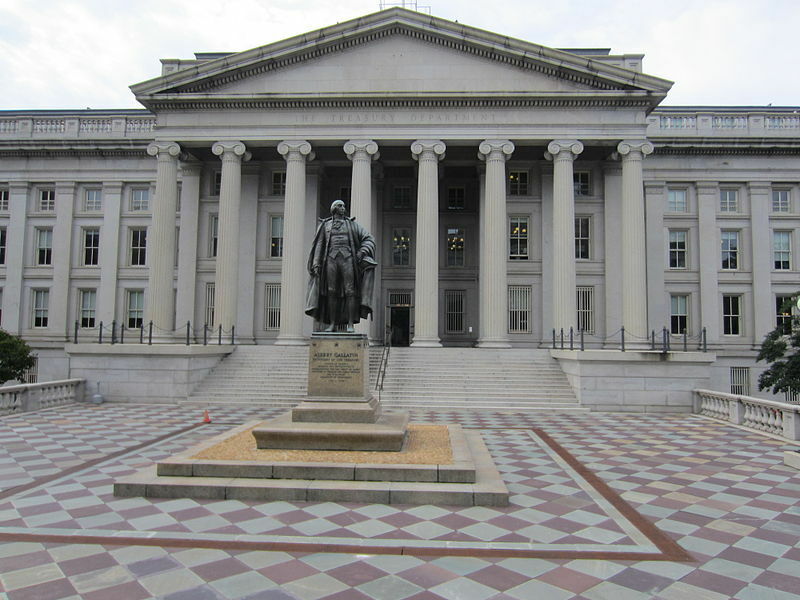 Robert Mills, who had been in the capital since 1830, was asked to assess the fire, and by 1836, his plans for a new Treasury building were accepted by Andrew Jackson. Undoubtedly, a major reason for Mills’s selection was his interest in fireproof construction, demonstrated by his Fireproof Building (1822-27) in Charleston, South Carolina. Mills had also studied with both Thomas Jefferson and Benjamin Latrobe. 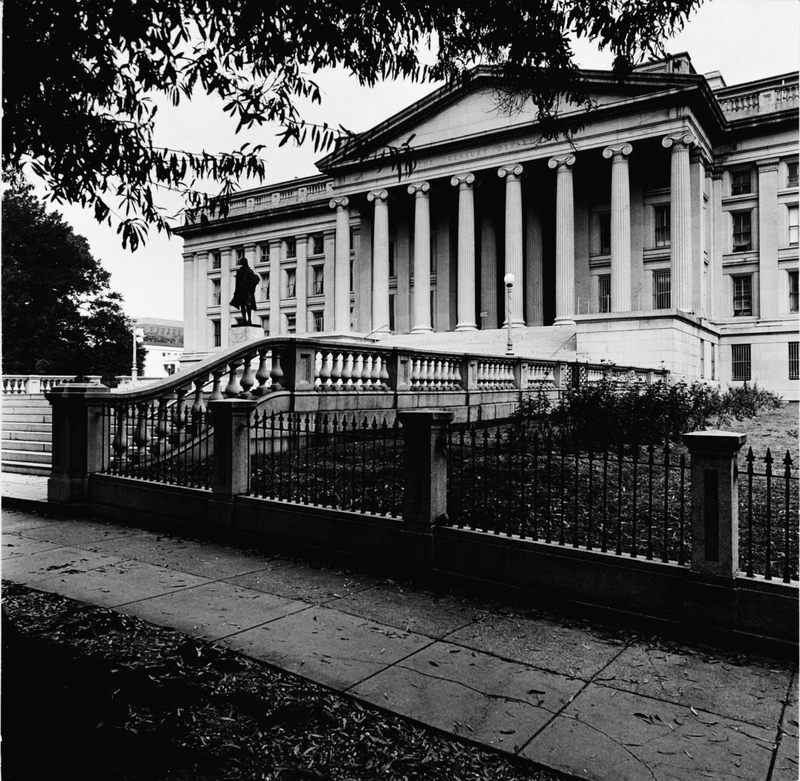 Mills’s design for the Treasury called for an E-shaped building opening west toward the White House, with a long classical facade on 15th Street, but only the east front and center wing were built under his supervision, from 1836 to 1842. The unusual vaulted structural system of the building and its monumental scale aroused suspicion in Congress, and some sharp professional jealousies among rival architects. 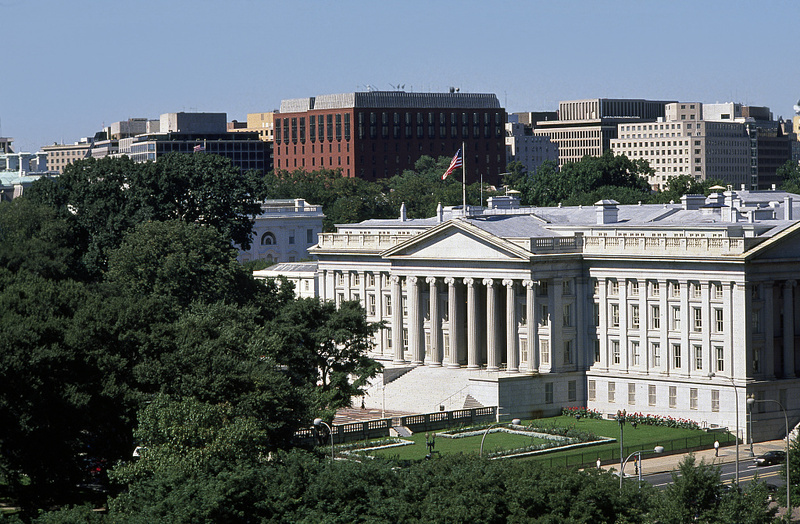 In 1838, a bill was introduced in Congress to authorize the demolition of the half-completed structure. The architect presenting the case for demolition was Thomas U. Walter, Philadelphia’s leading Greek Revival practitioner. Walter was appointed Architect of the Capitol in 1851, and he was authorized to prepare plans for extending the Treasury in 1855. His concept, which was carried through as others executed the work, established the ultimate rectangular layout, double courtyards, and portico facades. The south wing was built from 1855 to 1861, under the supervision of Ammi B. Young, appointed Supervising Architect of the Treasury in 1852. While Mills had been forced to use Aquia Creek sandstone, the extension was carried out in granite. The columns were monoliths, whereas Mills’ had been built up in drums. Young was abruptly dismissed by Secretary Salmon P. Chase in 1862, and replaced by Isaiah Rogers, who remained in the job until 1865, supervising completion of the west wing (1855-64), addition of an attic floor on all the wings (1863-65), and preliminary planning for the north wing. Upon his resignation, Rogers was succeeded by his former subordinate Alfred B. Mullett, who completed the north wing from 1867 to 1869. This wing contains the elaborately decorated marble Banking Room, which was the setting for Ulysses Grant’s first inaugural ball in 1869. The Mills interiors are minimally decorated, their architectural character resulting from the masonry barrel-vaulted corridors, flanked by groin-vaulted offices. The elegantly curved, cantilevered marble staircases are a signature of his work. In contrast, the interiors of the three later wings rely much more on interior decoration for their architectural character. Their structural system, influenced by the emergent cast iron technology, is one of shallow brick vaults supported on cast iron beams, producing rectilinear volumes and a much less sculptural appearance. In these wings, Young, Rogers, and Mullett made extensive and imaginative use cast iron of and cast plaster decoration, including cast iron pilasters and friezes in the main corridors. Mullett’s Cash Room is the most lavish space in the building, displaying seven varieties of marble in the paneled walls, and richly sculptural bronze railings for the balcony. By the late 1890s, the need for additional office space led to the insertion of a large truss-roofed drafting room in the south courtyard, for use by the Supervising Architect of the Treasury. The poor quality of the building’s original Aquia Creek sandstone led to the rebuilding of Mills’ colonnade. Architects York and Sawyer added an attic story to the building in 1909‑10, and made other alterations through 1923. The north entrance statue of Alexander Hamilton, by James Earle Fraser on a base by Henry Bacon, was also installed in 1923. 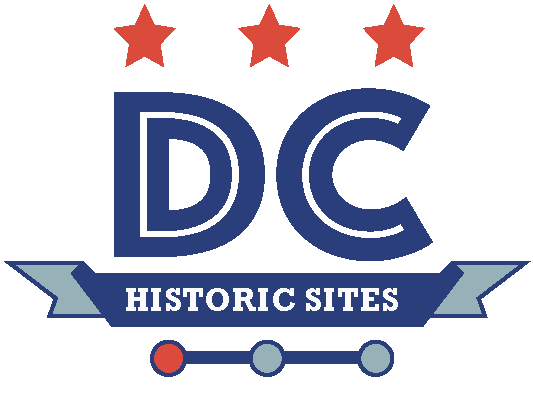 “Treasury Department,” DC Historic Sites, accessed April 24, 2019, https://historicsites.dcpreservation.org/items/show/603.